The world’s fastest sport on skates returns to Munich for perhaps the most harrowing and action packed track in the Red Bull Ice Crash series. This is the second stop in the famed Red Bull tour featuring one of the world’s newest extreme sports known as ice cross downhill. But because there are so many crashes, they call it ice crash. 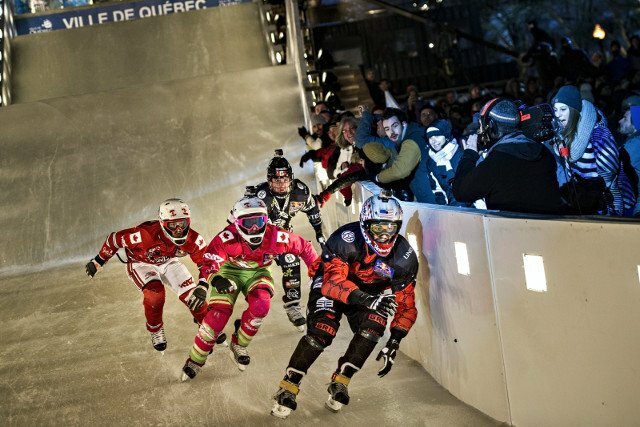 The event features competitors racing down an ice track essentially wearing hockey gear with plenty of turns and jumps to throw enough chaos into the mix so that nothing is ever for certain. The track in Munich features an unprecedented 40 degree slope and a jump at the end that’s 20 meters long. Competitors are expected to reach speeds of up to 30 miles per hour. The extreme sport that combines aspects of hockey and motocross racing began as a Red Bull world tour in 2010. After gaining popularity, organizations are hopeful the sport might be considered for the Winter Olympics. More than 100 of the sport’s best athletes will compete in Munch this weekend. For more on the event including live coverage of racing at 6:40pm CET on January 9 visit RedBullCrashedIce.com.